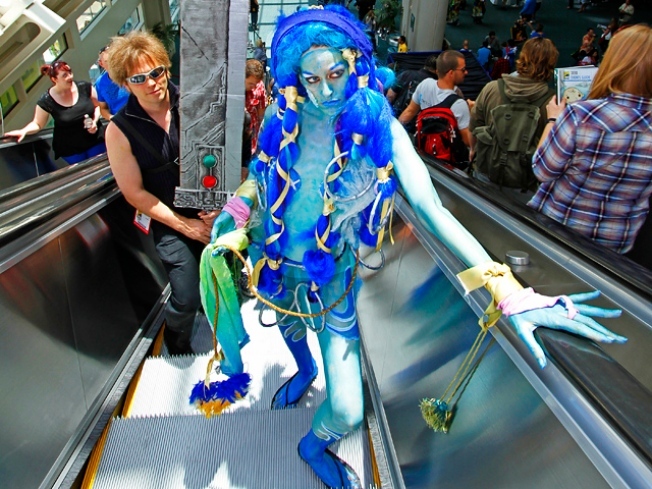 Dressed as a video game character from Final Fantasy video game character, Christina Evola, rides the escalator at Comic-Con. 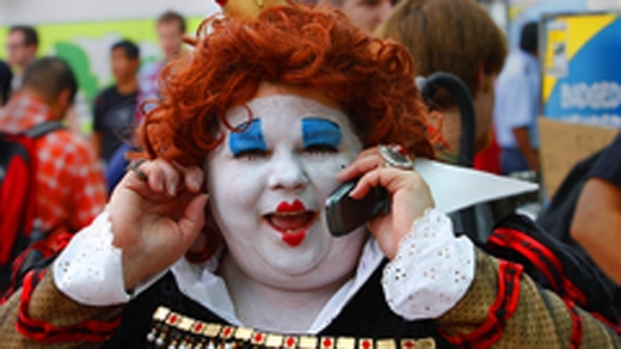 On Monday afternoon, about 30 people were gathered outside Hall H of the San Diego Convention Center, waiting in line for a 2011 San Diego Comic-Con International Convention panel. The all-female crowd sat in lawn chairs, lied on blankets and stood around the building's glass exterior in hopes of good seating to a one-hour Thursday morning session. What would it take to provoke three days of waiting? "I am waiting in line for Comic-Con, for the 'Twilight' panel," said a smiling Natalie Villegas. "Dedication ... We want to get in there. We want to get good seats. We want to be first." The panel for "The Twilight Saga: Breaking Dawn Part 1" will run Thursday from 11:15 a.m. to 12:15 p.m. It will offer fans a sneak peak at the next segment in the "Twilight" series with a filmmaker and cast Q&A, according to the Comic-Con programming schedule. None of those in line Monday, however, have yet picked up their Comic-Con badges, which will be distributed later in the week. Villegas said that, citing a new policy, Comic-Con employees told them no one is allowed to stand in line without a badge. "In previous years, they let us camp out and then pick up our badges right before we go in," said Villegas, who's been to Comic-Con twice before. "This year, they changed it (to where) we can't even line up until we have our badges." Beginning 3 p.m. Wednesday, only the Comic-Con attendees registered for Wednesday's Preview Night can pick up their badges at the downtown convention center, according to the Comic-Con website. Those not registered for Preview Night who have a four-day registration ticket or single-day Thursday ticket can pick up their badge at the same day and time but at the Town and Country Convention Center in Mission Valley. Registrants must show their barcode information and a photo ID to get a badge. Villegas said she's holding out hope that this year's process for the sold-out Comic-Con will respect her place -- and dozens of others -- outside the San Diego Convention Center. "I'm first in line now," Villegas said. "If they change it, I'm not looking good anymore ... It's worth it to me. I love it. You can tell, there are other people here; they love it. They want to be here."